Here is something fabulous that you can pick up "last minute" if you are a procrastinator over Christmas and if you have someone that is hard to buy for at any time of year...how about a foreign language course from Pimsleur?! I have ALWAYS been in love with foreign language and wish that I knew more than English and a beginner level in French and Spanish! My dad was fluent in Spanish - he went to night school for it, and he always encouraged me to learn - and I did, a little, to the extent that I can understand a Spanish conversation and many words but it isn't the easiest for me to have a full blown conversation in the language. Aside from Spanish, I have always wanted to learn something a little more "exotic" like Hindi or Japanese and have started Japanese in the past but felt a little overwhelmed and with not enough time, while working or running around after the children and doing basic every-day things that just got in the way! Pimsleur, however, got in touch with me this past week and offered me a course from their website, which you can download and play out on your iPhone, android phone or as a file on your PC or Mac. 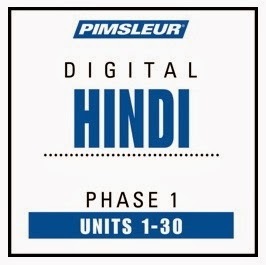 Of course I jumped at the chance to give learning another language a go and I dove right in with Pimsleur's Hindi I. Acquiring the course is very easy, you just head on over to the official Pimsleur store and check out the vast array of languages available to you and pick your course and level. Courses can be paid for with a few clicks and then downloaded within minutes to your device of choice with Pimsleur's FREE Course Manager app, which you can find very easily by searching your available apps on your device . I personally chose to download mine with Google Play for android and have it nestled comfortably on my phone to take on the go anywhere with me and to learn at any time, perfect! The Hindi course that I have is valued at $119.95 for 30 units on Mp3 - This compares to $345 for the CD and reading set, and so you can really save a bundle by using a download and it is less bulky, you can take it anywhere and it is available to you any time you have access to your course manager! This also makes for an affordable, educational gift, which you can give in moments to whomever you desire! I am currently on Unit 3 of the 30 unit course and so far I have learned how to have a very short conversation in Hindi. The units are designed to be used one per day on a consecutive daily basis for best affect and you are encourages to stick to one unit per day, but to go over that unit if you are not quite sure if you have retained as much knowledge for the current unit to proceed at this time. I have found that Hindi is actually a very easy language to get started with and I hope to see the course all of the way through and can not wait to see just how much I have learned by the end of it - be sure that I will be coming back and giving you an update sometime late in January to let you know! In the meantime, while I am walking around my house shouting in Hindi with my earbuds in and the children looking at me like I might actually be crazy with this big grin on my face and words they don't [yet] understand - I have a giveaway for you!! The fabulous people over at Pimsleur would like to offer ONE of you lovely readers the chance to learn a language of your own with a 30 unit course in the language of your choice on Mp3! You can choose from a vast array of wonderful languages and brush up on something you have already dabbled in or learn something completely fresh and new! I think this is a wonderful prize and I know that I would LOVE to get the gift of language for Christmas and so now we're gifting it to one of you!! You must be 18 or older to enter the giveaway but you can gift the language course to whomever you like of any age if they are the kind of person who will benefit from one of these courses! Please feel free to check out Pimsleur's website for more information, HERE and their Facebook page HERE to stay up to date or to request a language that perhaps you'd love to learn that they do not already include? They'd love your feedback, even if you just want to stop by to say Namaste! Disclaimer: Mom's Gone Bronson received a full 30 day course for this review. Prize will be in the form of a coupon code to download the MP3 30 unit course of the winners choice. We are not responsible for the winners capacity to use this course - they must have the means to store and play the course themselves via such tools as an android phone, iPhone, PC etc, which are not provided here. No bloggers participating in this promotion and giveaway are responsible for prize fulfilment. Thank you! I feel a strong urge to learn Spanish. My father in law and brother in law are both Mexican and I'd really like to have conversations with them. I've dabbled with Russian & Ukrainian in the past, but never stuck to it. I'd love to be able to pick either one back up again. I live in TX and almost EVERYONE here speaks Spanish its crazy! I really need to learn how to carry a convo! I'd love to learn German. I know the alphabet in German but that's it.